Kevin Cass rounding Quarter Bridge on the Cotton in the 1965 250 cc TT. Wollongong’s Kevin Cass raced motorcycles through the late 1950s, the 1960s and into the seventies, first at national level on dirt and tar, then on the international stage, tasting success on some of the world’s iconic road racing circuits. Yet the riding was only half the picture for Kevin – the engineering, the development, and the tuning of high performance racing motorcycles gave at least equal the satisfaction as riding them to the limit. In that regard, there can be little doubt he was greatly inspired by two earlier Wollongong rider/engineers Bill Morris and Clem Daniel. Kevin also successfully applied himself to running a motorcycle business, and after hanging up his leathers, kept his hand in the racing business by sponsoring several well-known riders. In later years he has undertaken eye-catching restorations of several classic motorcycles and a 1927 Alvis car, and even found time in 1994 to re-enact Arthur Grady’s 1924 around-Australia journey on a vintage Douglas. Kevin was born into a working class family at Ramsgate in Sydney’s St George district in 1938. He and his older sister were quite young when their father found employment at Commonwealth Rolling Mills, Port Kembla, 50 miles to the south. Being mechanically-minded, Cass Senior bolstered the family income by repairing clocks and watches on the side. This environment, being exposed to the inner workings of machinery, which included his father’s Harley Davidson motorcycle, clearly had an influence on young Kevin. The family travelled around by sidecar, and enjoyed camping trips to Kangaroo Valley, where their pet ferret earned its keep catching rabbits for the campfire stew, which was always shared with other campers. Eventually the arrival of two new additions to the Cass family, a second boy and a second girl, meant Kevin’s father had to bite the bullet and purchase a car. But not before Kevin had been bitten by the motorcycle bug. By the age of 16, he wanted a motorbike of his own, an idea his parents initially opposed. For a time during his teens he found a substitute in control-line model aircraft flying, eventually at competition level. The quality of his workmanship, and attention to detail, was immediately evident, and the involvement with high-revving small capacity two stoke engines was to stand him in good stead throughout his later career in motorcycling. His flying club president Clive MacDonald had an Acme 125 two stroke motorcycle, and when it was too windy to fly, they’d tear around the paddocks on the bike. Coincidentally, a young rider Kevin later sponsored, Warren Willing, also contested control-line aero competitions in his teen years. Kevin’s father was eventually worn down by various lobbyists, such as Uncle Artie, who owned a four cylinder Henderson motorcycle, and young Cass hit the road on his own motorcycle, a second hand BSA Bantam, an early rigid framed model. In 1955, aged 17, he joined Wollongong Motorcycle Club and used his burgeoning mechanical skills to make the Bantam suitable for club trials and gymkhanas. Being unable to beat Clive’s Acme, Kevin called upon the knowledge of senior Wollongong club members Bill Morris and Clem Daniel, who between them knew a thing or three about two strokes…now Kevin could beat Clive! The Bantam was by now no longer suitable for road use, so Kevin purchased a German 250 Adler two stroke twin, a model most influential upon early Yamaha designers. Kevin yearned to try his hand at open competition, but his father, whose signature was required on the application form for a competition licence due to Kevin’s youth, was opposed to the idea. After a couple of frustrating years spectating at local dirt-tracks and Mt Druitt road racing, Kevin finally obtained his competition licence, but now he needed transport for his highly modified Bantam. The Adler was traded on a second hand Ariel Square Four outfit for which he fabricated a platform to transport the Bantam. This was not an uncommon method for transporting racing machines in the forties and fifties, before the ever-burgeoning economy saw utes or trailers de rigueur by the 1960s. His racing debut was at an inter-club dirt track meeting at Goulburn’s Boxers Creek, a favourite circuit for the Wollongong gang. Of course, getting there and back involved negotiating the notorious Macquarie Pass, a precipitous, switchback climb up a heavily forested escarpment often enshrouded in mist, where giant tree ferns cling to slimy rock walls and ooze constant moisture towards the narrow, winding roadway. The journey home from one such meeting resulted in a never-to-be-forgotten night. It was stormy and the Ariel motor was playing up as the descent of the Pass loomed, causing Kevin to drop back from fellow club members travelling in convoy, and the word `travelling’ is used advisedly, for the boys knew the road well, even in the dark, and they were, after all, racers. The headlight was flickering in the pouring rain as the evening light disappeared, and finally the rear wheel of the hard-pushed outfit cried enough and collapsed. With a combination of pushing and slow rolling, Kevin was able to make a certain amount of progress, but was in a most exhausted, sodden and bedraggled state when eventually rescued by a clubmate who’d turned back in his Chev ute when Kev failed to join the group at the bottom of the Pass for `smoko’. A young Kevin Cass after winning the Australian 125 cc Short Circuit title at Victor Harbor, SA. Kevin’s riding and tuning ability meant the Bantam began to be noticed on the dirt tracks at Goulburn, Canberra and Young. He entered the Australian Short Circuit Championships, held near Melbourne, and after a poor start in the 125 final was closing on Ken Rumble when his ignition wire broke, Kevin’s first big disappointment on the track. Kevin’s burgeoning experience, engineering knowledge and ambition saw him seek more rides, briefly in partnership with a club-mate on a BSA 500 outfit, before fitting a DKW two stroke engine to a Jawa frame for 250 dirt-tracking. 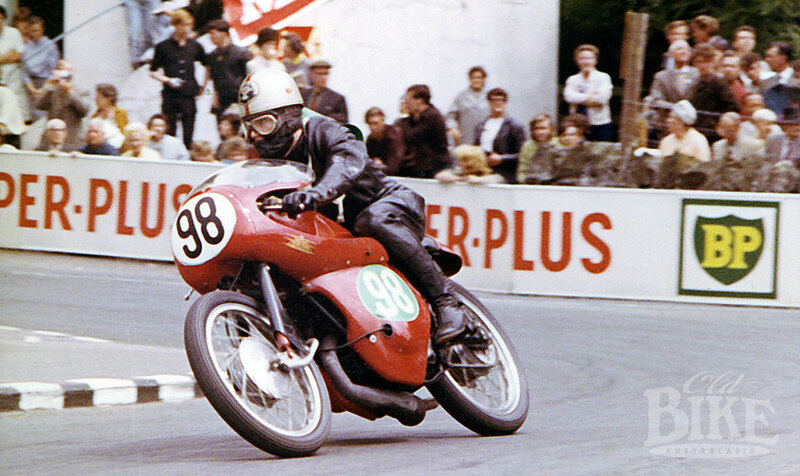 He now had the Bantam percolating well enough to win Australian Short Circuit titles in 1962 and 1963. Kevin also tried his hand at scrambling, and his forays included riding a Greeves at Sydney’s Moorebank track. But it was on the dirt Short Circuit tracks where Kevin excelled, and his club-mates had been constantly at him to put his quick Bantam into road racing trim. His Bathurst debut in 1962 showed promise, holding fourth place when the rings broke at McPhillamy Park, though he was able to nurse it home for sixth. For 1963 Kevin fitted a rather awkward-looking fairing, but during practice his friend Ronny O”Bree blew up his Honda so they fitted the dustbin fairing to Kevin’s Bantam and gained 10 mph down Conrod Straight. To fit the fairing, Kevin had to re-position the battery with rubber bands, and wire on the adjusted exhaust pipe. During the race the rubber bands broke, leaving the battery swinging freely on two wires, and the exhaust pipe came adrift. Riding with one hand holding the battery and one foot holding up the exhaust pipe, Kevin gained a creditable fourth place – just. The engine locked up as he crossed the line! At Hume Weir in 1963 Kevin stamped himself as a man to watch, riding the Bantam to third place in the 125 race behind Jim Redman (visiting from Europe) and Alan Osborne (both Hondas) and in front of Kel Carruthers on Clem Daniel’s MV Agusta. Kevin’s big break came in 1964 when Wollongong motorcycle enthusiast Jeff Martin, who made a good living reconditioning car engines, offered Kevin a ride on the new Cotton Telstar, a British 250 which, like the similar Greeves Silverstone, used the Villiers Starmaker two stroke single cylinder competition motor. Although it was no match for Kel Carruthers’ works 250 Honda four, and under constant threat from the ever-improving Yamaha twins, it took Kevin to many good placings, such as fifth at Bathurst in 1964, and second in the NSW and Victorian GPs. Kevin had also begun riding Clem Daniel’s rapid but unpredictable 125 CSD, a home-made two stroke single inspired by the East German MZs Clem had seen in Europe. Local wags, seeing a disc valve two stroke for the first time nicknamed this machine the Bacon Slicer, but Kev always took his slower Bantam to meetings as a back-up due to the dubious reliability of the CSD at that time. 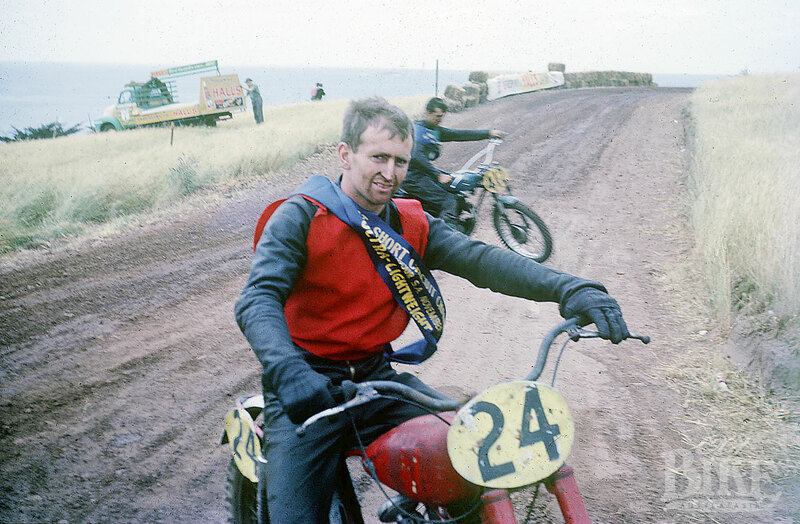 Kevin last rode the Bantam at Winton where a last lap missed gear allowed Ken Rumble to slip by on Bert Flood’s new TSS Bultaco. By the end of 1964, Kevin could no longer resist the urge to sample life on the Continental Circus, so he sold up everything and sailed for England in January 1965. Jeff Martin, who also sponsored Matt Daley and Graham Bartholomew on Cotton scramblers, had arranged for Kevin to pick up a new Cotton Telstar in England as well as a new 125 Bultaco from the factory in Spain. Additionally, Jeff arranged jobs for Kevin and travelling companion Graham Douglas at the Cotton factory. Kevin’s first start was at the non-championship Austrian GP where he scored two sevenths behind a squadron of MZs. These results, along with documentation from Australia, enabled Kevin to get a start at the Spanish GP, and we can only surmise that scrapping up and down Bulli and Macquarie Passes on the Adler, and racing at Mount Panorama, had prepared him well for Barcelona’s tree-lined, undulating, serpentine Montjuich Park for he achieved a fine eighth in the 125 and a stunning fifth in the 250. First and third in the 250 GP were Read and Duff on the works RD56 Yamahas, Torras was second on the works Bultaco, and Woodman fourth on the MZ. The Cotton factory staff was delighted and surprised, having underestimated the Aussie new boy. Next port of call was Douglas, Isle of Man, then regarded as the Mecca of motorcycling, and Kevin, like most other Aussie racers, wanted to test his mettle on the fabled mountain course. Before the roads were closed for racing, Kevin studied the circuit on a borrowed 600 cc Norton twin. For the 250 race, Kevin was issued with a six-speed Cotton, but a misunderstanding caused him to use the wrong fuel mix, and the machine seized during the race. He had much better luck in the 125, finishing a highly creditable ninth and first privateer behind a host of works exotica like Phil Read’s disc-valve Yamaha twin (1st) Luigi Taveri’s glorious-sounding four cylinder Honda (2nd), and Kiwi Hugh Anderson, who went on to win that year’s world title (his fourth) on the factory Suzuki. Full of confidence, Kevin made his debut on the British mainland at the famous post-TT Mallory Park meeting, but when down-changing the 125 for the famous Gerard’s Bend and six riders went past him flat out in top, he knew he had a lot to learn about British short circuit scratching! He finished sixth on the 125 and got lapped in the 250…. 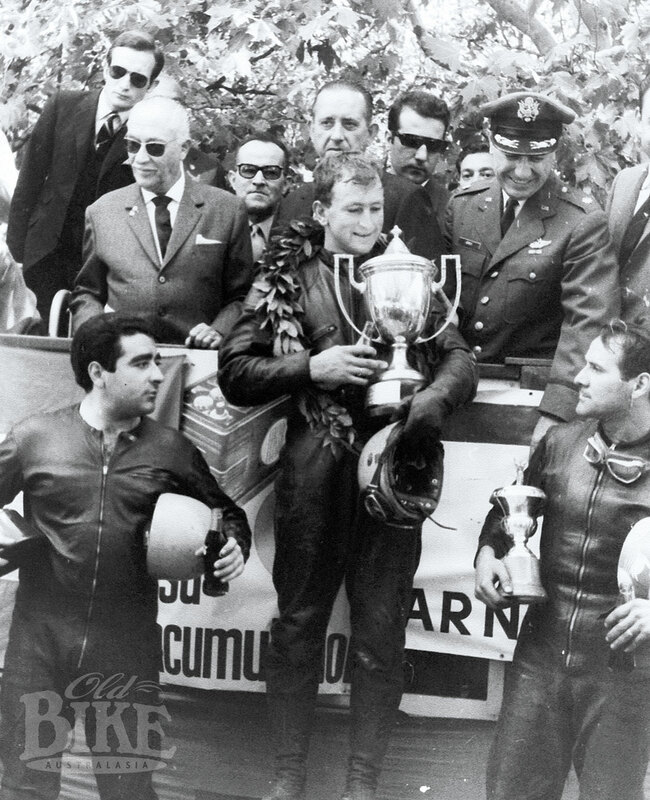 Enjoying the spoils of his first international win, at Zaragoza in 1965. Kevin had little luck at the following Dutch TT, but scored 8th (125) and 10th (250) at the long Ulster GP road course. Yet he continued to be dusted up at the shorter British tracks like Thruxton and Snetterton, Finally his Cotton teammate, the legendary Derek Minter (whom Mike Hailwood once described as the hardest rider he came up against), took Kevin under his wing and showed him the right way around the next track, Castle Combe, with an immediate improvement in results, a third place. Then came Cadwell, with a third in a 125 race won by Bill Ivy, and 4th in the 250. Near the end of the 1965 season, Kevin scored his first international win, at the Zaragoza event in Spain. Though not a round of the world championships, Kevin won the 125 race after the works Bultacos and Montesas crashed on the slippery track. Throughout the year, Kevin had collaborated with Englishman Ron Gardner developing a flat-slide carburettor for the Cotton, and later became the Australian agent for the Gardner product. Graham Douglas, along with another Aussie friend Dave Matthew, gave Kevin invaluable assistance with the many facets of preparation, transport, and racing around Britain and the continent. 1966 brought ever-improving results with wins at Croft, Snetterton, Scarborough, and Mallory, and podiums at most other National events including Mettet and Chimay on the continent. In the GPs there were numerous top ten placings, culminating in a third place for Kevin in the 250 Ulster Grand Prix on a TSS Bultaco, which proved more competitive than the Cotton. At the Isle of Man on the 125 Bultaco, Kevin set the fastest privateer practice lap, fractionally ahead of Dave Simmonds, Kel Carruthers and Jim Curry. During one practice session, a combined one for 50s and 125s, he could hear a machine behind him but couldn’t pick what it was, and daren’t look around while flat out on that narrow course. When it came past, he was mortified to discover it was world champion Hans George Anscheidt on the works Suzuki 50, a twelve-speed twin, and Kev was too embarrassed to tuck into the slipstream! Kevin finished ninth in the 125 race behind a dogfight of Japanese works bikes. After the TT, Kevin squeezed in marriage to London girl Virginia, before rushing off to the post-TT Mallory where he finished third in the 125 behind Ivy and Read. In 1967, Suzuki GB asked Kevin to partner Chris Vincent on a Suzuki Hustler in Britain’s premier production race, the 500-miler normally held at Thruxton but transferred to Brands Hatch that year due to the poor condition of the former circuit. They won the 250 class and finished third overall. This gave Kevin a toe in the door with Suzuki, and they offered him rides in the IOM on two new production racers, a TR50 six-speed single and a TR250 twin based on the road Hustler, intended to give Yamaha’s TD1C production racers some hurry-up. Three of the larger machines were entered, but Kevin’s and Rex Butcher’s failed to finish. Suzuki, like Honda, was pulling out of GP racing at the end of 1967, and didn’t put the necessary development into these promising machines, but private teams tried non-factory parts like Wiseco pistons and made them reliable. This was no better demonstrated than by Kevin himself, when he took a TR250 motor back to Australia, but more on that later. Kevin didn’t get to ride the 50cc machine owing to a crash in the 125 TT on the Bultaco, for which Kevin can find no other explanation to this day than sabotage. First, the machine wouldn’t start when the flag dropped, and it had always been a fast starter, then the back brake anchor bolt came away, causing him to crash and end up in hospital with a broken collarbone and concussion. Later, another fall, at Oulton Park due to an engine seizure, caused Kevin to assess his situation objectively. 1967 had been largely a good year, the Isle of Man aside, with too many wins and placings in British domestic racing to list here. One memorable result was fifth in the 125 Ulster GP on the Bultaco, one fifth of a second behind Kel Carruthers after a fine scrap a distance back from the works riders Bill Ivy, Phil Read (V4 Yamahas) and Stuart Graham (Suzuki twin). Yet Kevin could see the writing on the wall – the factories were pulling out and prospects were few, so he, Virginia and new baby Karen headed for the sunshine with numerous achievements and experiences to reflect upon. Kevin had rubbed shoulders with some of the sport’s great riders, and his three year European sojourn had coincided with a golden period of intensive factory rivalry that produced an aural symphony of exotic multi-cylinder exhaust sounds from Japanese and European works bikes so pleasing to the ear, long playing vinyl records of the ‘music’ were commercially produced. They arrived in Australia not particularly flush with funds, but with a crate-load of interesting motorcycle paraphernalia. They settled at `The ‘Gong’ where Kevin quickly got his old job back at the steelworks. Yet as brightly as the big flame burned night and day at Port Kembla, so did the motorcycle flame continue to burn in Kevin. He set up a workshop at home and continued tinkering with the disc valve, reverse-cylinder 125 TSS Bultaco he’d been developing in Europe. He also built the KBC (Kevin Brian Cass) Special. This featured the TR250 Suzuki engine he’d brought back from England. He improved the motor and installed it into a Bultaco TSS frame. Resplendently presented in its Suzuki factory-replica blue and silver fairing, Kevin’s KBC was immediately competitive in local 250 racing against the TD1C and TD2 Yamahas and A1R Kawasakis. The fact that Victorian Peter Jones also did very well with a TR250, along with success for the model in New Zealand in the hands of Geoff Perry and Keith Turner, suggests Yamaha’s eventual near monopoly of the over-the-counter 250/350 racer market may not have been as dominant had Suzuki persevered with this model. By 1969, the TR2 350 Yamaha was the gun machine for 350 and Open class racing and Nowra building contractor Frank Ellis put Kevin on one, with immediate success in the Senior 500 cc title at Phillip Island’s Australian TT meeting. On the TR2, and then a later TR3 model, Kevin continued to rub shoulders with the crack local riders – Toombs, Hindle, the Hintons, Atlee, Horsman, Blake, Warrian, and the Maddens – for the next couple of years. Many recall this as a golden era in local racing, with a swarm of top-grade riders on near-identical Dunlop Triangular-shod Yamaha twins going at it hammer and tongs in every race. In 1968 there was a somewhat unusual chapter in the local racing scene. Ty Hardin, a hunky American actor well known on local TV screens for his portrayal of wild west drifter Bronco, had come to Sydney to film the action adventure Riptide TV series on the sparkling waters of Pittwater. He liked what he saw and with a glamorous model on his arm, the couple made quite a splash, and decided to spend some time in Sydney. Ty opened a Kawasaki franchise at Dee Why on the northern beaches and tried to popularise metal flake custom paint applications. To promote his products he sponsored dirt and tar racers like Ken Bushnell and Tom Connor (an American who had been successfully campaigning a CB77 Honda racer in B grade races locally prior to the arrival of Hardin) on largely unsuitable mounts. Old codgers like the author remember the large marquees set up at Moorebank scrambles track and other venues to promote Hardin’s wares. It is believed the 250 A1 and 350 A7 disc valve road twins were given a run, and the 350 Kawasaki Big Horn two stroke single was tried on the dirt and the tar, manfully ridden by Bushnell against superior machinery,. A 650 W2 four stroke pushrod twin was gamely ridden by Tom Connor at Oran Park, but neither was transformed into a winner by the application of metal flake paint! Quickly realising the racing limitations of these Kawasakis, Hardin decided to sponsor selected riders on pukka racing machinery by providing leathers and entry fees. Kevin Cass as well as Keo and Rob Madden (the father and son duo who’d already been racing Kawasaki A1R disc valve twin racers) were fitted out with eye-catching silver leathers embroidered with blue stars, quite a contrast to the almost universal black leathers of the day. After a relatively short blaze of publicity, Bronco rode off into the sunset, never to be seen here again, though Kevin continued to wear those distinctive silver leathers for some time afterwards. Arguably, Hardin’s Kawasaki assault was mis-timed by just a year or two, for the H1, H2 and Z1 models began ruling the roost soon after. One might also add that Hardin probably also misunderstood the differences between American and Australian motorcyclists of that time in regard to customising. At Hume Weir in 1969 Kevin was still trying to sort out bugs in the KBC125 he’d been developing with limited budget and backing and got into a dice with a long-haired young university student named Peter Stronach, who was riding the wheels off a race-kitted A100 Suzuki. Kevin decided to keep an eye on the progress of young Peter, and when Kevin got caught up in a bad accident at a 1970 Hume Weir meeting caused by Ken Blake’s engine seizing, he decided to scale down his riding, and offered his machines to Peter in a sponsorship arrangement. Kevin felt he’d only been riding at 80%, and it was time to hand over the reins, in addition to being concerned at the effect the accident had upon his young daughter. Peter had some stirring rides on the KBC250 and went on to become one of the hardest riding punters of the all-conquering Yamaha 350 models in the next couple of years. In one of his last races, Kevin pilots Stan Coleman’s Suzuki to third place in the 500cc class of the 1971 Castrol Six Hour Race. Though no longer riding pukka racers, Kevin re-lived his British Production Racing days by sharing a 250 Suzuki with fellow Continental Circus graduate Phil O’Brien in the first Amaroo Park Castrol Six Hour in 1970. At the following year’s event, Kevin and Stronach rode Stan Coleman’s Suzuki 500 to third in class. By the time the third Six Hour came around, Kevin had taken the plunge into motorcycle retail, taking over Bill Morris’ Yamaha shop in Crown Street Wollongong. With new baby John having arrived, Kevin hung up his leathers and promoted his new business by putting Peter Stronach and Geoff Sim on an RD350 in the 500 class and Warren Willing and Murray Sayle on an RD250 in the smaller class. Warren and Murray won their class, but a dream debut for Kevin Cass Motorcycles in both classes was spoiled by a flat tyre to Stronach while furiously contesting the 500 class lead with Joe Eastmure and Les Kenny. The following year, Kevin formed a partnership with Lee Roebuck to sponsor Murray Ogilvie and Richard Bassett on an RD250, and they finished sixth in class. Warren Willing and Murray Sayle worked in Kevin’s shop when it first opened. On their respective TD3 and TR3 Yamahas, Kevin sponsored these two future stars, who lived in the Cass household at Unanderra for a time. Both riders went on to forge careers at the top of their sport. A few years later, Kevin encouraged a young Wollongong rider by the name of Wayne Gardner, giving him advice and technical assistance. An insight into Kevin’s creative thinking can be given by examining just one chapter of his varied sponsorship years, his involvement in 125cc racing through the 1970s. 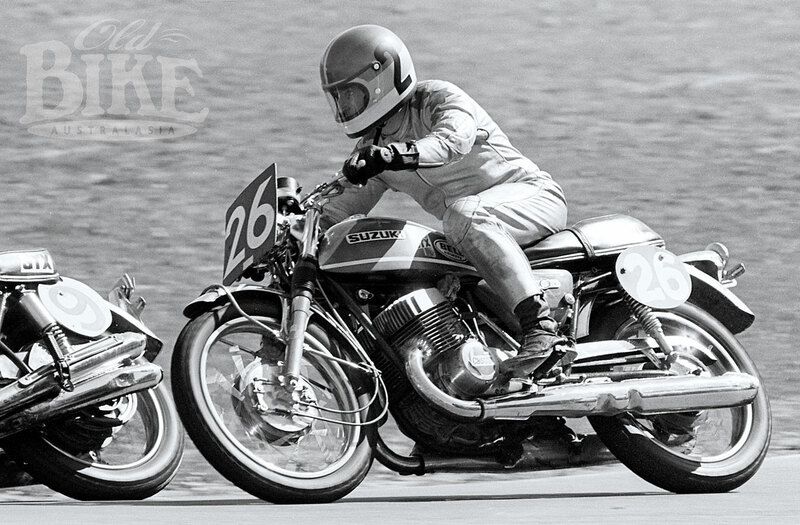 Having purchased a TA125 Yamaha and given it the Cass treatment, he put Geoff Sim on board to contest the 1975 Australian title, contested over rounds in all states. Not content with that, he’d noticed Kawasaki was producing a disc valve air-cooled single cylinder moto-crosser, and decided to build a road-racing special around that engine for Dave Burgess to ride in the series. Kevin drew on the experience obtained trying to perfect the disc valve Bultaco TSS (the KBC125) and achieved far greater reliability and results with the more modern machine. His development work was so effective that the Australian title went down to the wire at the last round, Perth’s Wanneroo Park, between Sim, Burgess and Rob Hinton (Yamaha TA125), with Sim coming out on top for the title. Sim also captured the 1976 title, which included a memorable scrap between the two Cass riders at Bathurst and resulted in Sim and Burgess recording the only dead-heat for first place ever seen at Bathurst. By the following season, the Yamaha twin had been sold and the air-cooled Kawasaki faced a limited future due to Australia aligning itself with international racing regulations regarding fuel. Air-cooled motors ran relatively cool on the methanol fuel allowed in Australia until then, but it was about to be banned. Kevin realised he needed to water-cool the Kawasaki if it was to remain competitive on pump petrol. Coincidentally, around that time Kevin had given assistance, including accommodation, to New Zealander John Woodley, during his successful foray into Australian racing on the RG500 Suzuki square four. While helping John replace a damaged cylinder, Kevin decided to repair the discarded one and see if it could be fitted to a spare Kawasaki KX125 crankcase. Thus he built up a second special, and mounted the Suzuki cylinder in the reverse position, with the carburettor facing forward. Once sorted out, it proved outstandingly fast. Kevin, though nearing forty, decided to dust off the leathers and enter the 1978 Bathurst meeting, believing that while he might not ride as hard as the young blokes, his speed down Conrod Straight (there was no chicane then) might make the difference. Sure enough, in practice he swore it was going like a 250 on the fast mountain course. Unfortunately, the dream evaporated when time came for the 125 race. Having warmed the machine up in the very precise manner high performance two strokes require, the start was delayed by an accident in the preceding C grade race. The assembled 125 riders on the dummy grid, in spite of Kev’s request, were denied the opportunity to properly prepare their machines for the delayed start, and when the flag dropped, the Special wouldn’t fire, thus the moment was lost. The legacy of these specials lives on today. Trevor Liversidge obtained the ex-Burgess machine and followed Kevin’s lead by fitting a Suzuki RG cylinder, though not in the reverse configuration Kevin had tried. Trevor’s friend Bernie Summers, wanting to resurrect his racing career in classic racing, purchased this machine enabling Trevor to fund the construction of a second Cass replica and these two are now the riders to beat in Australian 125 Classic racing. The September 2010 Australian Championships at Phillip Island saw Trevor take the win with Bernie second. Through the years, Kevin’s business prospered and he was forced to find a larger premises a few blocks away in Keira Street. Eventually he sold this business to Geoff Sim and retired to the `farm’, near Dapto, where he has tackled the restoration of veteran and vintage motorcycles with the same passion and nous he applied to his racing pursuits, often travelling with old friend Dave Matthew to swap meets to track down parts. Not restricting himself to two wheels, Kevin found time to undertake a magnificent restoration of a 1927 Alvis Tourer car. With second wife Helen, many enjoyable car and motorcycle rallies have been undertaken. 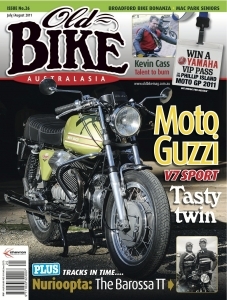 Kevin’s mechanical engineering background places him perfectly for conquering any restoration challenge, and enabled him to make the trouble-free lap of Australia (part-sponsored by Australian Geographic magazine) on the doubtless-uncomfortable fore-and-aft flat twin 1924 Douglas mentioned earlier, and described in more detail in OBA13. Mind you, two years earlier he’d warmed up for that feat of endurance with a mere `stroll’ to Perth and back on a 1926 Henderson! And so we’ve had a glimpse of the nuts and bolts of Kevin’s motorcycling journey to date, and we’ve no space left to discuss his helpfulness, generosity, his winning smile and playful sense of humour…. Acknowledgement is given to `The Kevin Cass Story’, by Kathy Gates, Revs Motorcycle News, 1973; also to the Cotton newsletter. Thanks also to Helen Cass, Virginia Tierney, Karen Cass and Graham Batholomew.